Heat oven to 400°F. 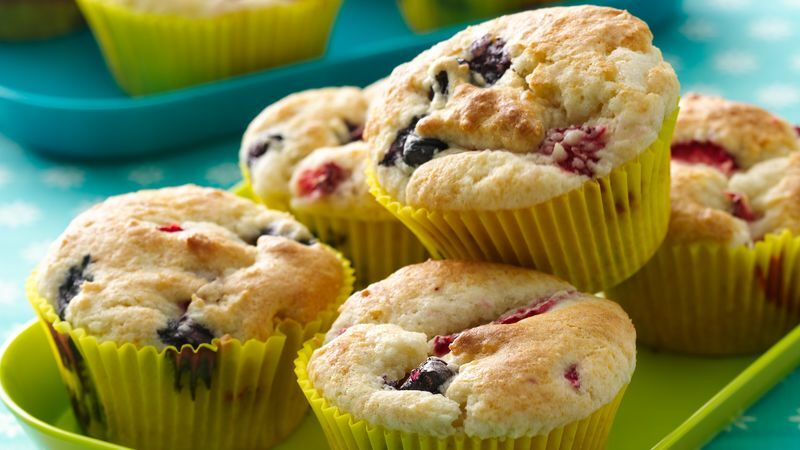 Place paper baking cup in each muffin cup; spray inside of paper cups with cooking spray. In large bowl, stir all ingredients except berries just until moistened. Fold in berries. Spoon batter evenly into muffin cups. Bake 15 to 16 minutes or until toothpick inserted in center comes out clean. Cool 5 minutes; remove from pan to cooling rack. Just before serving, sprinkle muffins with powdered sugar. Serve warm. *Small blueberries will distribute more evenly between each muffin. Frozen blueberries, thawed and very well drained can be used, but they may bleed into the muffin batter when mixing.